Fiocchi is a well known European cartridge producer that has continued to build its reputation as a quality supplier to the U.S. market. This product is excellent for target practice, plinking, and shooting exercises. Each round has a boxer-primed, reloadable brass casing and non-corrosive powder. No problems with this ammo used in my Taurus PLY .25. Hard to find .25 in general but Lucky Gunner has it! I had NO problems with this ammo....I shot several rounds...quick fire...and they fired good and straight without jamming or miss-fires. Good little bullet for a decent price but then all the ammo I have received from your company has been up to my expectations. I purchased this box of 25 ACP for my wife to use in her pocket sized Bauer Automatic. I am happy to say it was received promptly and we blasted half the box without a single misfire. 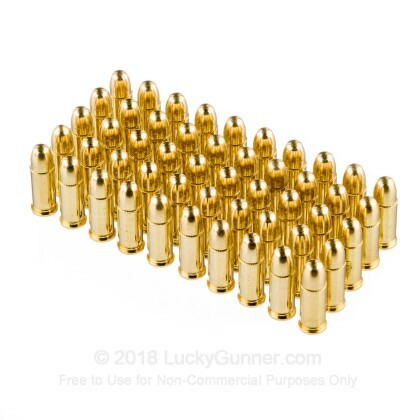 I appreciate Lucky Gunner having this ammo available because many of the local shops in our town either don't carry it, or make it into a special order and tack $5-8 on to ship it in for me. You offer a fair price and quick delivery. I will be doing business with you again. I had searched many different hardware/sporting goods stores which had no inventory of the ammunition I had been looking for. I found the caliber of ammunition I had been searching for for some time. Life is good again with Lucky Gunner. Very good products, dont shop anywhere else.! Excellent customer service, needed help in selection to identify what I needed and was given accurate info. 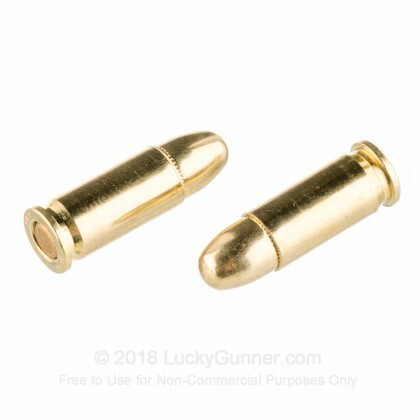 Will continue to buy at Lucky Gunner..
Hard to find .25acp rounds always in stock and ready to ship! Amazingly quick service on hard to find ammo. I am pleased with the quick service on hard to find ammo. I have ordered several different types of ammunition and have been pleased by the prompt service and reasonable prices. Pleased with in-stock inventory. Product performed as expected on test range. Exceeded expectations. No misfires, and very clean. Lucky Gunner has a great site and service. Excellent product with Excellent service! I purchased this ammo to test fire my Bauer pistol. So far I have shot 50+ rounds without any problem. Super product! Web site is great and so easy to see if product is available. It shows, it's there! No hassles with purchase and delivery very timely. Highly recommend using LuckyGunner to at least check pricing. Not always the best prices but very competitive. Great value, pereformance andf quality. Very good service from Luckygunner. Will definetly ude Luckygunner for my ammo ordfers. I pruchased this because of the good price. I have to say it rocks. No problems what-so-ever. I see the price of ammo keeps going up. Buy this now while you can. Delivered lightning fast. 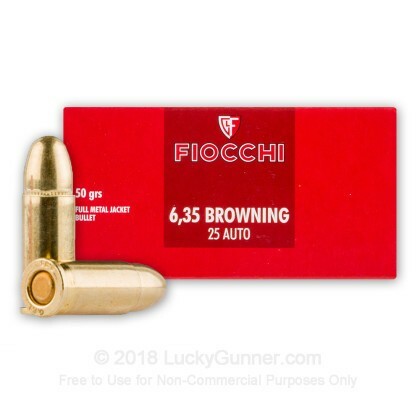 Fiocchi Ammo good ammo at a great price! 25 ACP is expensive and hard to find. Hornady stop making XTP Bullets Just sells ammo now. 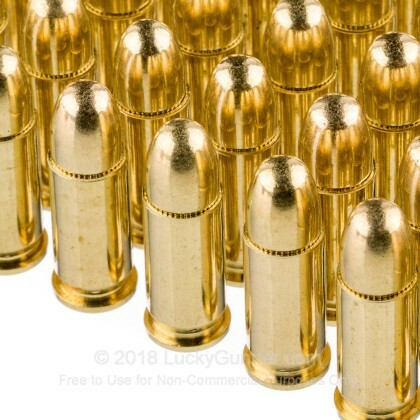 Speer still makes Gold Dot JHP bullets. Lee still makes Dies. Cheaper to buy loaded ammo for brass at these prices. This is my first order with Lucky Gunner and I am very pleased with thier service. 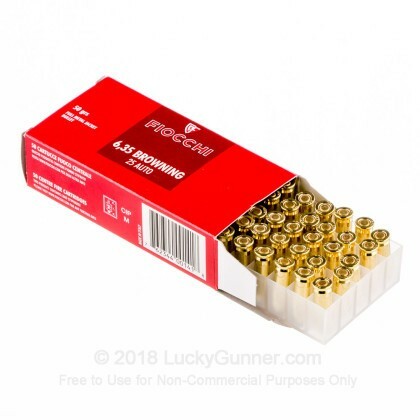 I searched high and low, only to find Luckygunner.com has the best price on .25 ammo around. Fast shipment, and easy people to deal with. I use this ammo in a Beretta 6.35mm and the weapon is used as a backup, or ankle gun, to my Glock 9mm, Nice little gun. Hard to find this ammo at a decent price. The ammo fire flawlessly from my Beretta Jetfire. Fast delivery and great price. Thanks Lucky Gunner. VERY GOOD PEOPLE TO DEAL WITH. FAST SHIPPING. 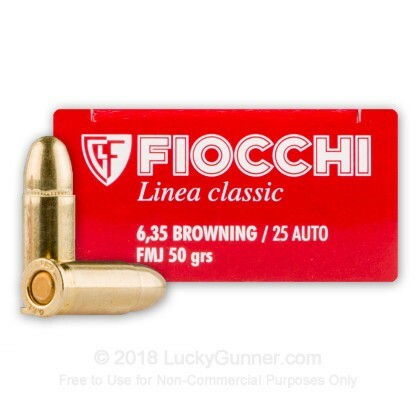 We also have this 25 ACP - 50 Grain FMJ - Fiocchi - 1000 Rounds ammo in stock in a bigger quantity.